The Goods and Services Tax (GST) is an indirect tax system set to be introduced in India starting July 1, 2017. GST, the overall aim of which is to reform indirect taxation in India, will replace the traditional taxation exercised by the central and state governments. The idea behind GST is to amalgamate several central and state taxes into a single tax. To a consumer, GST promises a reduction in the overall tax burden on goods, currently estimated to be at 25%-30%. The new regime also implies free inter-state movement of goods, free of state-level tax or entry tax. GST accounting is also expected to reduce paperwork involved in goods transfer. Advocates of the tax regime point out that the GST model will minimize crusading or double taxation. GST is planned to make taxation a simpler online procedure, making it easier to administer and enforce. Another aspect of GST is that it will regulate the unorganized sector. On the other hand, critics of the tax model say that it will imply higher tax burden for manufacturing SMEs and lead to an expansion of operating costs. For businesses, complying to GST may call for an overhaul of the existing software systems. It will also imply registration in multiple states. 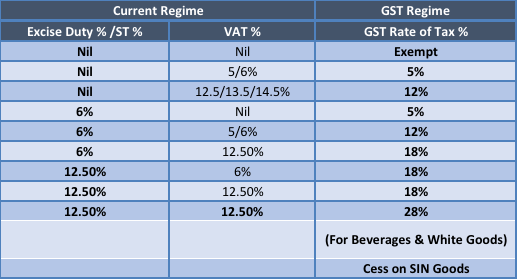 Moreover, unlike traditional systems, GST levy will fall in the middle of the year. A registered taxpayer opting for the composition scheme must pay tax at a rate which is not more than 1% for manufacturer and traders and 5% for restaurants. What kind of transactions will GST touch? GST will cover all kinds of trade ranging from the sale, transfer, purchase, barter, lease, as well as import of goods and/or services. The taxation, administered through a dual model, will be applied both at the Union and State government levels. Since GST is a consumption-based tax, the levy will be in the state where the goods or services are consumed and not the state where they are produced. The composition scheme was conceived to help small traders with annual turnover less than INR 1.5 crore. This scheme is strictly for businesses that deal with goods. While services providers are out of its purview, restaurant sector taxpayers can opt for the scheme. A dealer who opts for composition scheme are not eligible for input credit and cannot issue tax invoice. Change is never easy. It is important to take a leaf from global economies that implemented GST and overcame the teething troubles to experience the advantages of having a unified tax system, easy input credits, and reduced compliances. Once GST is implemented, most of the current challenges of this move will be a story of the past. India will become a single market where goods can move freely and there shall be lesser compliances to deal with for businesses. 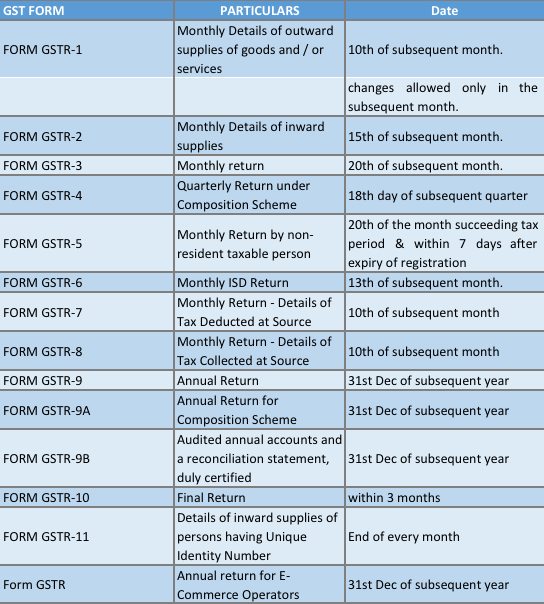 How Can a Business Register for GST? 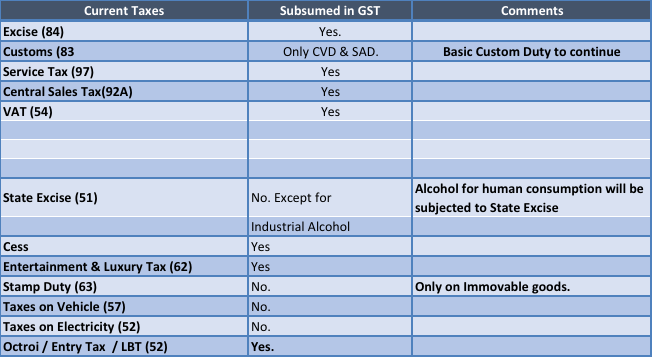 How your enterprise registers for GST will depend on whether you are a new user or one who is already registered under the traditional taxation system. 1. Submit your PAN, mobile number and email address in Part-A of Form GST REG–01. This can be done on the GSTN portal or through Facilitation center (notified by board or commissioner). 2. The GST portal verifies your PAN, mobile number and e-mail address. Once a one-time password helps you complete the verification, you will receive an application reference number, shared on your registered mobile number and to your E-mail. You will also receive an electronic acknowledgement in FORM GST REG-02. 3. You must now fill Part- B of Form GST REG-01 and will be asked to specify your application reference number. The form can then be submitted after attaching the required documents. 4. In case any additional information is pending, Form GST REG-03 will be issued to you and within seven working days of its receipt, you must respond with the sought information in Form GST REG-04. 5. Once you have furnished the required information, you will receive the registration certificate in Form GST REG –06 for the principal place and for every additional place of business. 6. If you own multiple business verticals in a state, you can file separate applications to register each business vertical, following the above steps for each. 7. Your registration can be cancelled if the details you submitted are not found satisfactory. The registration is rejected using Form GST REG-05. If you want to deduct TDS or collect TCS, you must apply for registration in Form GST REG – 07 for registration. If you are not liable for deduction or collection of tax at source, then you will receive a notification about the same. If you own a business which is already registered for indirect taxation such as VAT, ST or Excise etc., you will need to register your business for migrating to GST. 1. Create User ID & Password on a Common Portal To initiate your enrolment for GST migration, you must start with a provisional ID and password given to you by the respective State VAT department through dealer’s login. Enter the provisional ID & Password on the GST common portal to get your new User ID and Password on e-mail and mobile number. The portal also has provisions to help you reset a forgotten password. Once your user ID & Password are registered, you must login to the portal, where your provisional GST number starting with the state code followed by 10-digit pan number and three system generated digits will be displayed. You will be asked to enter various business details and upload various documents at this stage. Now, you must update the details of authorized signatory including PAN No and Address with proofs.. Finally, you must digitally verify and submit the documents along with your digital signature/ Aadhar card. Once you complete all the above processes successfully, you will receive your ARN and temporary GST ID within 24 hrs. If you need help registering for GST, you can seek the services provided by chartered accountant firms in this field. Copyright © 2019 MS Associates. All Rights Reserved.